Vivaldi's Cello gives listeners a chance to hear a different kind of Vivaldi. Some of the music on this vinyl set was written by the composer to feature the cello of his day, but that's only half the story. Vivaldi's Cello couples those scores with music that Vivaldi originally intended for the violin, the viola d'amore or the human voice. Music that's now been transcribed for the cello. 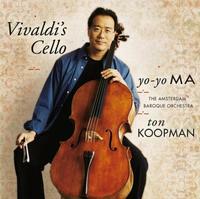 On this album, Yo-Yo Ma plays the 1712 Stradivarius cello that he had already appropriately altered for the two Simply Baroque recordings he made with Ton Koopman and the Amsterdam Baroque Orchestra. Ma also uses a Baroque bow, and he adopted the relative tuning (in which instruments are tuned only in relation to each other) employed by the orchestra. The Amsterdam Baroque Orchestra performs on period instruments and uses Baroque performance practices. Koopman says Vivaldi's scores were only slightly altered to give voice to the cello. "Vivaldi didn't write differently for a singer than instrumentally," says Koopman, "I maybe changed the ornamentation to make it more instrumental. I also looked for pieces for lower voices, so we could leave them in the same key." Of course, any notion of this album ignoring what is now Vivaldi's most famous piece was out of the question. And so in a brief nod to the enduring popularity of The Four Seasons, Ma and Koopman play an arrangement of the throbbing Largo from the work's "Winter" Concerto. "In Vivaldi's slow movements, you can play with your heart," says Koopman. "The music feels at home." Vivaldi's Cello is now finally available on vinyl for the first time.